Yes, cats suffer from achy hips and joints too! Especially older cats. Zuke's Hip Action Cat Treats increase agility and decreases pain...naturally. Each Hip Action bite contains 50mg of Glucosamine HCL and 35mg. of Chondroitin Sulfate plus co-factor vitamins, minerals and amino acids. No yucky liquids or messy powders, the joint soothing nutrients in Hip Action are packed into delicious easy-to-feed bite size treats. 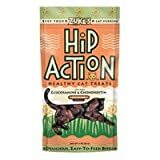 Make your cat more comfortable today with Zuke's Hip Action Cat Treats.